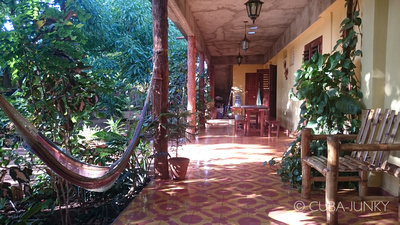 My review about the casa: We really enjoyed our time at Casa Los Mangos with Fiona and Ossiel, they are great hosts! 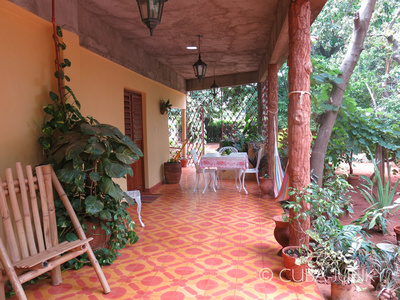 Their Casa is just on the edge of town with an easy walk to the square or a quick bicycle taxi for a couple of CUC’s. Fiona was very helpful with suggestions for restaurants and entertainment. She arranged all of our taxis: from Havana, to Playa Ancon, as well as to Santa Clara. We had delicious meals for both breakfast and dinner. Fiona prepared chicken for dinner that was tender and well seasoned. She made a vegetarian lentil curry that was yummy too. Their food was some of the most seasoned/spicy we had in Cuba, which is a nice change because typical Cuban food doesn’t have a lot of spice. We enjoyed our time in the garden, sitting on the patio and relaxing in the hammocks listening to Ossiel play guitar while drinking Canchancharas. And of course we enjoyed their two dogs Honey and Wombat. We would definitely stay with them again! How was your room? : Clean comfortable and spacious. How was the food they offer? : The food was very good and plenty of it. Other services they offer: They offered laundry service which was really nice and we greatly appreciated having clean clothes. Other comments: A lovely Casa and garden with wonderful hosts! My review:	We had a wonderful stay at Casa Los Mangos. Fiona and Ossiel were fantastic hosts, extremely helpful and accommodating. We loved engaging with Fiona about her experiences in Cuba and she has an incredible knowledge of her adopted country. The casa is a retreat from the busy, tourist-filled centre of Trinidad, a 10 or so minute walk to the centre. The rustic, farm feel, and hammocks make for a truly relaxing experience. The rooms are spacious, private, and very comfortable. The breakfast was the best we had during our stay in Cuba. We also enjoyed a lovely dinner with the hosts and other guests, and were treated to Ossiel's singing and guitar playing. Highly recommended for anyone who has a couple of days in Trinidad and is happy to be slightly removed from the action, while still being able to access it easily. How was your room? : Spacious, modern, private, comfortable. Included the provision of a mini-bar and mosquito net. How was the food they offer? : Excellent. Best breakfast we had in Cuba. Lovely juices, homemade banana bread, and guava marmalade. Other services they offer: They recommended we break our journey to Baracoa by spending a night in Camaguey, booked our accommodation in Camaguey, and organised a taxi to take us there. They also provided us with beach towels. Other comments: Staying here was pure bliss and one of the highlights of our trip to Cuba. My review: Our stay at Casa los Mangos was without doubt the highlight of our trip to Cuba. It's a beautiful house with a stunning garden to relax in. We really felt at home there. Fiona and Ossiel are the most amazing hosts - attentive, helpful and really friendly. They clearly love their town and are keen to offer any advice or tips to help you experience the best of it. We went on some brilliant bike trips with the help of Fiona's directions. She also knows the most beautiful places to walk and swim; we never would have ending up biking up to El Cubano park and swimming in the most stunning waterful without her advice. She also pointed out the spots to snorkel off the beach without needing to take a catermaran trip - which saved us a lot of money! Ossiel is a professional musician and provided some beautiful music in the evenings. Strangley enough, the best part of our stay was leaving; we had to get over to Sancti Spiritus to catch a night bus and not only did Fiona and Ossiel organise a taxi for us, they arranged for a stunning red and white Cheverolet to take us there, AND they came along for the ride to take a few detours and give us a guided tour of some of the harder to reach sights the coutryside had to offer. How was your room? : Perfect. It was big and airy, with windows, AC and a fan. Big comfy bed with mosquito net and gorgeous traditional Cuban quilt, fridge, private bathroom with shower. The room had a private entrance and also had double doors that opened out into the beautiful garden. There was also a garden table hammocks just outside our door for relaxing. How was the food they offer? : Excellent! Fiona and Ossiel are both brilliant cooks! We ate there every night because the food was so good; they offered lots of choices. Dinner included a starter and dessert, which was often home made ice cream :) , and was always delicious. Their food often included flavours and ideas that you just don't get in Cuba, and this was so welcome after eating plenty of bland food elsewhere. The breakfasts they serve were the best we had in Cuba, and a highlight of the whole trip - they included Fiona's incredible homemade banana bread, plus fresh fruit salad and eggs from the garden, unusual freshly made fruit juices, great coffee and plenty more. Other services they offer: We hired bikes and snorkelling gear for very reasonable prices. They also make wonderful cocktails!